The above info came from Michael Leal, and was edited by yours truly (contact me). The image came from SuperRobots.com. 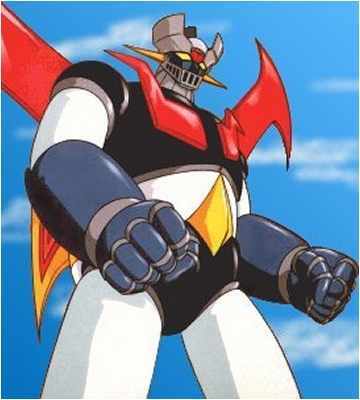 Created by Dr. Yumi, Mazinger Z is a powerful robot designed to defend Japan from the evil Dr. Hell and his minions. Its body hides a variety of weapons-- it can fire missiles from its elbows and fingertips, use its fists as a projectile with and without blades (Rocket Punch and Iron Cutter respectively), fire Photon Beams from its eyes, and unleash a powerful blast of energy called the Breast Fire. While normally bound to the ground, Mazinger can dock with a rocket pack called the Jet Scrander to take to the skies. Eventually, Dr. Hell builds a female counterpart to destroy it, named Minerva X; it looks like Mazinger in many aspects, although its very feminine in body. The robot-- showing signs of having its own mind-- ends up falling in love with Minerva X, and even mourning it when it must be killed for trying to kill Kouji's friend Sayaka in her Diana A.
TranZor Z serves Kouji well, defeating the forces of Dr. Hell quite handily. Its defeat finally comes at the hands of the forces of Great Mazinger's arch-nemesis, the Great General of Darkness, only to be saved by Great Mazinger in a rather famous scene in Japanese fandom. The above description came from Michael Leal, and was edited by yours truly (contact me).